I was a bit of an odd kid. I didn't have many friends and I didn't want many friends. Friends wanted you to come out and play. And I? I didn't like their games. Introverted and sometimes shy, I had any number of stories taking shape inside my head and those were the "games" that interested me. 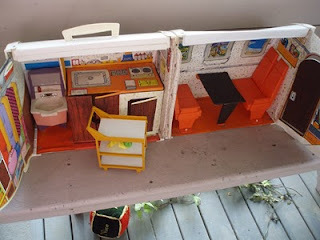 Play was about acting out dramas with the people in my life - Fisher Price Little People, paper dolls, Barbie. Other people, real people, were much more unpredictable and would take my story lines to places I did not anticipate or desire. When friends would occasionally come to my door and ask if I could come out to play, I'd tell my mom to tell them no, I couldn't. She indulged me in this and would continue to indulge me well into my teens (OK, 20's), assuming the role of "Mean Mom" so that I could lose myself within myself and my own creativity. I have a solid memory, recalling minute details, from when I was 4. I'd been playing alone in my room - with Barbie and her Barbie-like pals in their Barbie Friend Ship Plane - when I was called to lunch. Fully engrossed in the story I'd created and in the process of acting it out through my dolls, I was not particularly interested in lunch. But Betsy insisted and out to the kitchen I went. As I sat down, my sister, Rache, did something to me - I don't remember what, but I know it was mean - and I, not recognizing the smell of danger...yet, got angry and threatened, with glass in hand, to dump my milk over her head. Mom caught me and sent me back to my room...which is precisely where I wanted to be anyway. Win. Several hours later, she would come looking for me, having forgotten she'd sent me there, and would discover me still enacting the story I'd started much earlier in the day, talking to no one, interacting with no one, except myself. So it should come as no surprise then that I began writing early. And I don't mean writing as in penmanship exercises (although I did those too...for fun). I mean writing stories for people to read. I believe I was 7 when I wrote my first story and illustrated it. I penned (well, OK, fat penciled) several of these tomes in my spare time. Not for homework, for fun. Betsy swears she has them still...we've just never been able to find them again. One, oddly enough, was about a cruise1 ship. My illustrative capacities were severely limited and didn't last past that first stage of fiction writing. As evidenced by my attempts to illustrate on this blog, my drawing talents have not evolved past the 2nd grade. However, my writing skills, those were just natural. Like with Dr. Jenni and her dancing or Rache with her crafting or Franny and his guitar and songwriting - just there to be honed...or forgotten. I thought everyone could write. It didn't occur to me there were people out there who felt as though they couldn't do it or, worse, people who found it painfully difficult to do. So, I wrote. I entered the Young Author's writing contest several times and throughout elementary and junior high school focused on fiction. In high school, I discovered the "joys" of poetry and wrote several free verse and what would later be considered slam poetry. I journaled from the age of 10 - most notably regarding my crush on Ricky Schroeder (shutup). I carried around a notebook, kept a notebook in my car, and even went so far as to write scraps of ideas on napkins, business cards, or paper towels. I got involved with an abusive boy/man who, by the end of the relationship, had stripped me down to nothing. My self-esteem/confidence/worth was shattered and I no longer had a voice or had anything important to say. So I stopped talking. It would take me nearly 10 years to start the process of re-discovering my voice and to start writing again. 10 ultimately stagnant, painful years trapped in a dead-end, long distance relationship where there were empty promises and no self-awareness. It was safe and I was hiding...from life...from myself. I don't know what prompted me to begin again. Perhaps it was a necessity as it began through letter writing. First, to a boyfriend in Texas. Then to a couple of friends in prison. Years, days, hours I spent writing for rapt audiences of one. Through those letters, I began finding my way again, working through some of my baggage, unpacking, discarding, repacking. Cathartic, it was, all that writing. And I found a voice there. A loud voice. An interesting voice. One filled with poignancy, laughter, sarcasm, and joy. I wanted more than letters. I wanted...something. I didn't know what. At first, I didn't share my blog with anyone (it wasn't this one) except Dr. Jenni. Then, as I gained in confidence, I began friending blog people - some I knew, some I didn't. I started and maintained several other niche blogs on other sites. I wrote (and still do) sometimes a half dozen times or more a day. And a couple of years ago, I took a deep breath and began to write stories again. Stories I've found quietly percolating since the early 90's in my head. Barbie and Co. doesn't act them out anymore. Neither do the paper dolls. The characters rarely go on cruises and I try not to provide illustrations. But they are coming out now...sometimes so fast I can't type fast enough to capture all of them. Hopefully, one day, I'll be brave enough to share them with someone other than Vinny, the Best Cat Ever. But even if I don't ever show them, I will always write - as long as I am able -blog entries, letters, articles, poems, and stories. I never realized I'd been holding my breath along with my voice. 1: This was the late 70's and early 80's - at the height of The Love Boat's popularity.